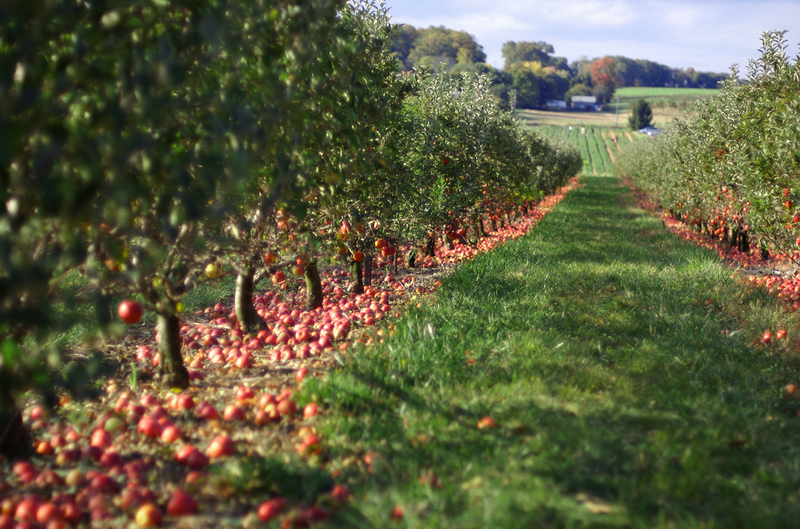 Apple Picking: Plan Your Trip Now! As the fall season gets started, many Americans will head to a farm or apple orchard to pick apples. This is a very common American tradition since it's a fun activity to do with family or friends and apples are especially delicious fresh and in season! Apples are a very healthy and popular American snack. They can also be used in a variety of ways—you can eat them fresh, add to recipes like salads, or cook them. Apple pie and apple cobbler are delicious and traditional American desserts. Many recipes, particularly baked goods and desserts, call for apples so this is a great (and fun!) way to get them in bulk at a reasonable price. Image courtesy of Jeff Kubina. Apples originated in the Middle East in the area between the Caspian and Black Sea more than 4,000 years ago. English settlers brought them to the Americas in the 1600s and 1700s. A famous historical figure that many children learn about in school is John Chapman. He is better recognized by his nickname, "Johnny Appleseed," and is known for introducing apple trees to large areas of the United States. He has become a legend for planting the crop across the country and for his kindness and generosity. He is responsible for giving apples their strong place in American culture. The best apples will be firm and bruise-free. When you bite into them, you want them to be crisp and crunchy, not soft or mushy. Since apples ripen from the outside of the tree towards the center, the apples on the outside of the tree will be most ripe. To pull an apple off the tree, don't pull straight away from the tree, it is easier if you roll the apple upwards off the branch and twist it. Once picked, don't throw your apples in the basket, place them gently or they will bruise and spoil more quickly. You should also keep apples cool after picking them to increase their shelf life. Don't forget to wash them thoroughly before eating or use in cooking. It may be tempting to eat them as you pick, but remember they aren't washed and you haven't paid for them yet! There are so many different kinds of apples and they range in taste, size and color. They vary in color from green to yellow, orange, bright or dark red or a combination. They also range in flavor and can be sweeter or more tart. In fact, some are better to pick in certain months than others. For a complete list of types of apples and a guide for when best to pick them, click here. The best time of year in general to pick apples is mid July to late October with most of the apples available in the early fall. September and October will likely be the best times to go. Don't just stop at apples! Many orchards are part of larger farms, which may offer a variety of other fruits, vegetables and produce available for purchase. You can come home with a whole assortment of goods. Try to get a pumpkin or two to carve if they are available—pumpkin carving is another great fall activity enjoyed by individuals across the U.S. It's especially popular as it relates to Halloween, a holiday celebrated in the U.S. on October 31st. You can find a list of apple orchards by state here. You can also use this link to search for information on where to pick all of your favorite fruits, as well as tips on how to can, freeze or make jam with your fruit. Most orchards will be in the countryside and rural areas, so it's important to check in advance if public transportation will be available there. You will most likely need a car, and depending how many apples you pick, your bags may be heavy! Some orchards charge admission, but most don't and instead charge you based on the weight of the apples you picked to purchase.